How Is Knokkers Not an Olympic Sport? Knokkers is one of those rare athletic endeavors that's greater than the sum of its parts. And when the parts in question are jumbo-sized billiards and bowling, that's really saying something. 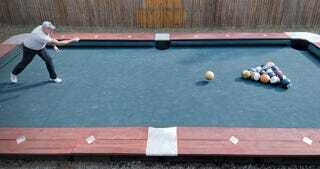 Invented by former cage fighter Steve Wienecke, Knokkers couldn't be more simple; the rules are the same as 8-ball pool, except you roll the 6-pound balls instead of using 8-foot long cue. The original set, seen here, was a labor-intensive installation in Wienecke's Fredericktown, Missouri backyard. But he's working on a portable version—including 6 pound balls that can stand up to the rigors of constant collision—and plans to distribute it to bars with large backyards and whimsical patrons.